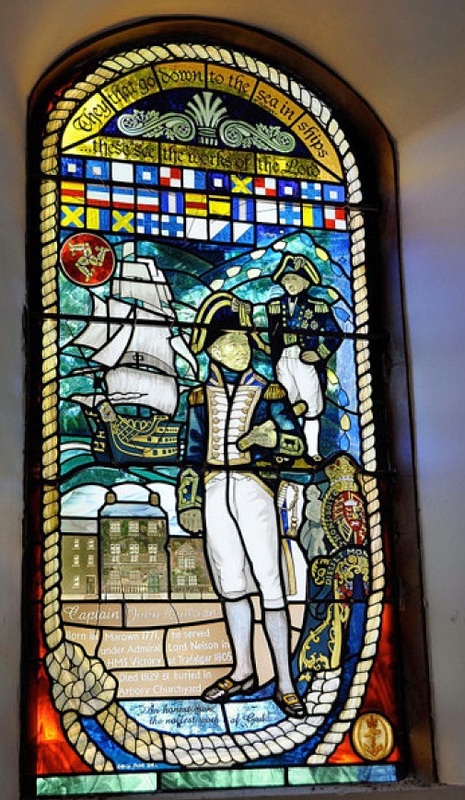 The Quilliam window was commissioned to celebrate the life of Captain John Quilliam RN and his role in the Battle of Waterloo. Funds were raised through the Quilliam Group, with a generous donation from the Trustees of Manx National Heritage. The window is the work of local artist Colleen Corlett and was dedicated in 2015. Captain John Quilliam RN was the most famous Manxman to have participated in the Battle of Trafalgar. Born in Marown in 1777, Quilliam is believed to have been the son of a Manx farmer, but joined the Royal Navy in 1794. He rose through the ranks and came to the attention of Admiral Lord Nelson at the Battle of Copenhagen, and Nelson requested that he serve aboard HMS Victory. During the Battle of Trafalgar, the ship’s wheel was shot way, and Quilliam rigged up a temporary method of steering her using ropes, in the gun room below. After the war, Captain Quilliam returned to the island, married a member of the Stevenson family of Balladoole, Arbory, and resided at Ballakeighen. He also lived at Balcony House in Castletown. He became an MHK, and improved boat design for the Peel herring fleet. He died in Kirk Michael, in 1829 and is buried in Arbory churchyard. Inscription reads as follows: "Sacred to the memory of / John Quilliam ESQR. Cap. in the Royal Navy / in his early service he was appointed NY ADML. Lord Duncan to act as Lieutenant of the / battle of Camperdown, after victory was achieved, the appointment was confirmed. / His Gallantry and professional Skill at the Battle of Copenhagen attracted the notice of / Lord Nelson, who subsequently sought for his services on board his own ship, and as his / Lordships first Lieut. He steered the Victory into action at the Battle of Trafalgar. / By the example of Duncan and Nelson he learned to conquer; / By his own merit he rose to command; / Above all this / He was an honest man, the noblest work of God. / After many years of honourable and distinctive service, he retires, / to the land of his affectionate solitude and birth, where in his public station as a / member of the House of Keys, and in his private life he was in arduous times the uncompromising / defender of the rights and privileges of his countrymen, and the zealous and able supporter / of every measure tending to promote the welfare and best interests of his country. / He departed this life on the 10th October 1829, / In his 59th year of his age / This monument is erected by Margaret C. Quilliam to the memory of a beloved husband. "